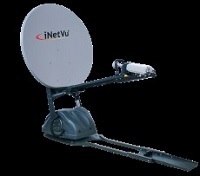 C-COM Satellite Systems Inc, the leading global provider of mobile auto-deploying satellite antenna systems, has received type approval for its iNetVu® Driveaway and Flyaway antenna systems from Telenor Satellite, a major satellite provider of broadcast and data services throughout Europe and the Middle East. “C-COM’s next generation vehicle mounted and transportable antennas continue to rack up approvals with first class satellite operators and service providers, most recently with Telenor on THOR 7.” said Drew Klein, Director of International Business Development for C-COM Satellite Systems Inc. “Customers can now easily roam between beams with C-COM’s 3-axis motorization and our auto-polarization switching function. This will give Telenor customers the option of a fully approved, land based system capable of finding satellite in just a few minutes with the press of a button.” Klein continued. “Telenor Satellite launched Occasional Use (OU) Ka-band services on THOR 7 at the end of September. In the period before the launch Telenor worked closely with C-COM to achieve type approval for their Ka-band auto-deploy antennas,” commented Lisa Barlow, OU Sales Director at Telenor Satellite.